11:44PM UPDATE: The following information has been received from CPD. The victim, 31, was sitting in her parked car when a man walked up and told her to open her door while implying that he had a gun. After she was out of the car, a second man took the victim's backpack with a laptop, phone, and money inside. Police described the offenders only as being male and black. The car was found unoccupied late tonight in the 3000 block of West Lexington in the Garfield Park neighborhood. No one is in custody. Police are investigating the armed carjacking of a woman in Lakeview on Saturday evening. The woman told police that she was near Kenmore and Barry when two men approached and took her car at gunpoint around 7:30 p.m.
Officers tracked the four-door, black Chevy Cruze heading south on Halsted Street, but they lost the tracking signal on the DePaul campus, police said. The car's plate number begins with "Z258." Also taken with the car were the Logan Square woman’s purse, laptop, and phone. The police department’s Office of News Affairs does not yet have a description of the offenders. CWBChicago will update this story when the department’s information is completed. 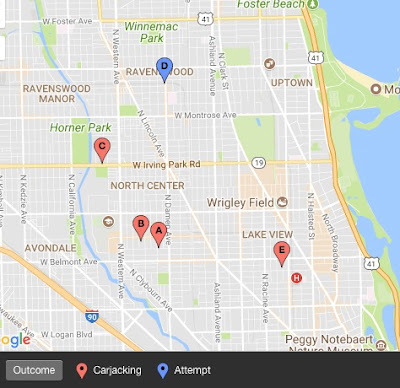 Tonight’s carjacking is the fifth in the Town Hall police district since Tuesday, but the first in Lakeview. Four of the crimes have involved armed men.